Does it go to the grave, or exile? 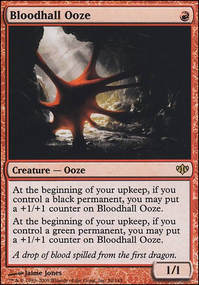 Whenever another creature is put into a graveyard from play, you may put X +1/+1 counters on Kresh the Bloodbraided, where X is that creature's power. Honestly it depends on what you're looking to do with deathtouch and trample. Personally, as far as BG (Golgari) commanders go, I personally love The Gitrog Monster and it does have deathtouch. Also, you can always make a deathtouch/trample deck with Jarad, Golgari Lich Lord . 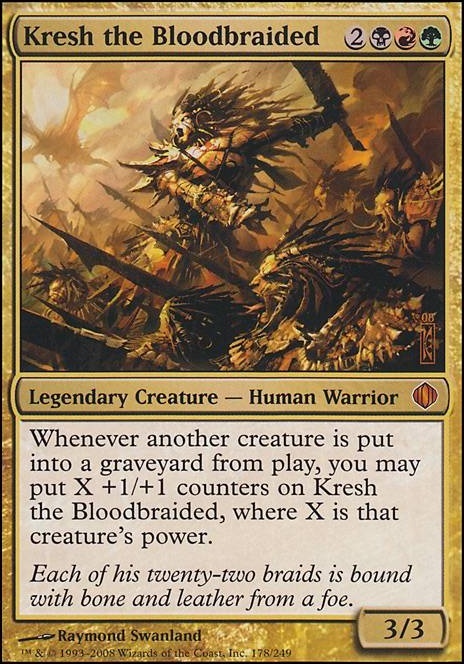 If you're willing to go a third color, I think a commander that would work out well also is Kresh the Bloodbraided . 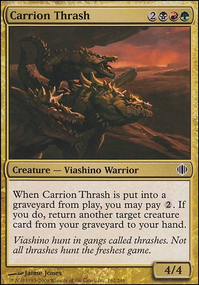 For one thing, Kresh decks are combat oriented so keyword givers and keywords in general are great, and Kresh works best if you're killing off lots of creatures. I might pass on Kindred Summons and Aid from the Cowl , but I really like the synergy between Fires of Yavimaya / Rhythm of the Wild & Descendants' Path . Definitely adding that one! I've never seen Flameshadow Conjuring before, but I think I'll try that too! Free triggers for Omnath's second ability feels really good! I have a Kresh the Bloodbraided deck that would love this card! I like the shadow born apostle idea. Seeing as how there’ll be an Essence Warden out for all the life triggers, a Wall of Limbs could be added as well. It’s worked great in the current Ghave version and in conjunction with Jared, it becomes far better than its current ability, but at least there's a backup ability if Jared's not on the field. 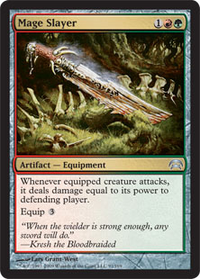 Going off the Krav and Wall of Limbs idea: I’ve got a Kresh the Bloodbraided deck where I use giant kresh to kill people with Dying Wish and Jarad effects. 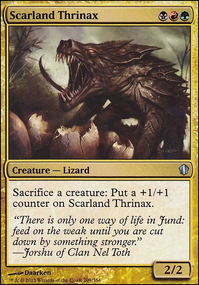 However, I have another where I turn him into many small creatures (for Impact Tremors effects) which I then sac back into big creatures ( Carrion Feeder or Skullmulcher for Blood Artist effects) something that could be an interesting direction with Carnival and the creature etb triggers for into Exsanguinate or swampy tricks. 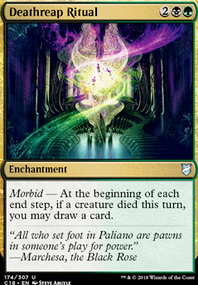 Korozda Guildmage is an example, but there's a handful of others I've found, though Carrion , Ghoulcaller Gisa and Fungal Sprouting would be the added choices for a Golgari deck. Here's the deck for ideas/conversation's sake - you all will be the first to see it. It wasn't ready to go public cause I'm editing up the flavour story still and need to balance it a bit more for consistency... It's got a side mill strategy but mainly kills through ''growth and decay'' (hence the name). I think it could inform a strong take on a Carnival version, related to the style seshiro_of_the_orochi is hinting at. I'd add carnival to it actually, if I didn't have to remove much of the synergy the deck needs for the Essence Warden and other life gain effects. I like this one. I think your description is accurate... ramp, haste, beat face. The deck is slow to get going, but it can close out games quickly. Kresh is very synergistic with the deck. He would act as a secondary wincon, whereas the Wurm is merely a nice utility card. The above comments are great ideas. your color pie is really skewed so your deck needs to be reworked. in a normal deck you would want the land section and the spell section to look similar you are running a lot of blue lands but few blue cards. Normally this means you should swap some lands around to level it out but given Najeela's ability needs blue, you need to add some blue spells instead. Given the budget the lands you have and the above lands are about as good as you can get. When rotation hits shock lands are going to go on sale so it might be a good time to pick them up if you want. some other lands not mentioned which you might want to look into are the vivid set great for mana fixing in the early game and for extra combat fixing in the late. Terramorphic Expanse , Evolving Wilds , and Ash Barrens are great simple searches that you can never go wrong with. I personally prefer Lairs over the tap trilands. A land coming into play tapped can set you back a turn. Lairs can be used the turn they come into play and should be the last land you play from your hand. They can be a little clumsy if your next draw is a land though. Review your current cards to make sure they're something you really want, given the number of mana symbols in their casting cost. 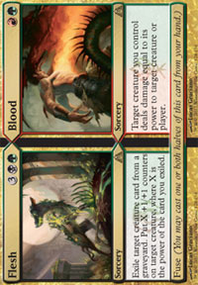 Kresh the Bloodbraided might seem like a really good card but he has three mana symbols in his casting cost. The more mana symbols a spell has the harder it is to mana fix for it. When you have the fixing and ramp power of green I'd avoid mana rocks over ramp spells you might consider swapping Commander's Sphere out for something like Harvest Season . In-fact you need to run harvest season the ability to grab every basic land in your deck is great mana fixing. Look into cards with my personal favorite is Sylvan Reclamation exile two threats and if you don't have the mana to cast it get a land instead. Civic Wayfinder and Jungle Wayfinder hey look warriors and land searching two for one. Bring to Light having land roblems search for a ramp spell. opponent about to swing in with an eldrazi next turn; bring to light removal. Want to search for and cast a creature you don't have the mana colors for bring it to light. Sword of the Animist multiple combats means multiple searches. Hope these tips, tricks and cards help you with your mana fixing let me know if there's another part of the deck you want help working on, and have fun! From those you mentioned, ayli seems the most interesting. Slimefoot seems pretty cool as well. I have two aristocrat style decks I'd suggest as well: Regna, the Redeemer and Krav, the Unredeemed are a nice token/lifegain deck. 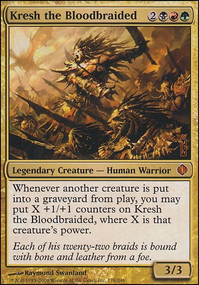 And Kresh the Bloodbraided has a very combo-esque feeling to him without being that much of an actual combo deck. First off, I want to say that i love the deck concept. Hydra tribal is an awesome concept (my brother has a simic hydra tribal deck and it's great to see), and loads fun. However, i'm curious about Gyrus as a commander for this deck. ouot of the 18 hydra's I counted (not including Gyrus), half of them are 0/0 for x in their casting cost, making them a bad target for gyrus. 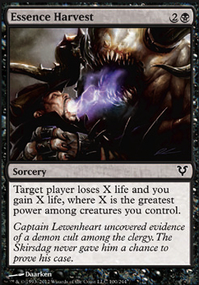 I feel like that shut's down half of the deck when it comes to your commander. 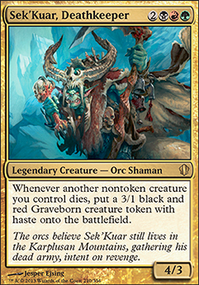 If counters are the main focal point of the deck, i would recommend considering Kresh the Bloodbraided as an alternate commander, while keeping the hydra tribal. Now that being said, if you are cpommitted to gyrus, i'd definitely toss in Parallel Lives to go alongside Doubling Season. getting two tokens is better. Getting even more than two is ideal. 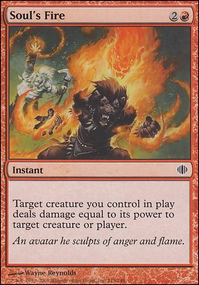 I'm a big fan of Flameshadow Conjuring for Jund decks. It feels great to get two big creatures out instead of one. Just remember it doesn't work with X creatures. I also feel like Walking Ballista would like this deck as well. With all of the counter support and mana, it could be a great mana dump/kill machine. I hope this helps! What are you looking for in terms of feedback? I'll provide better insight knowing that.